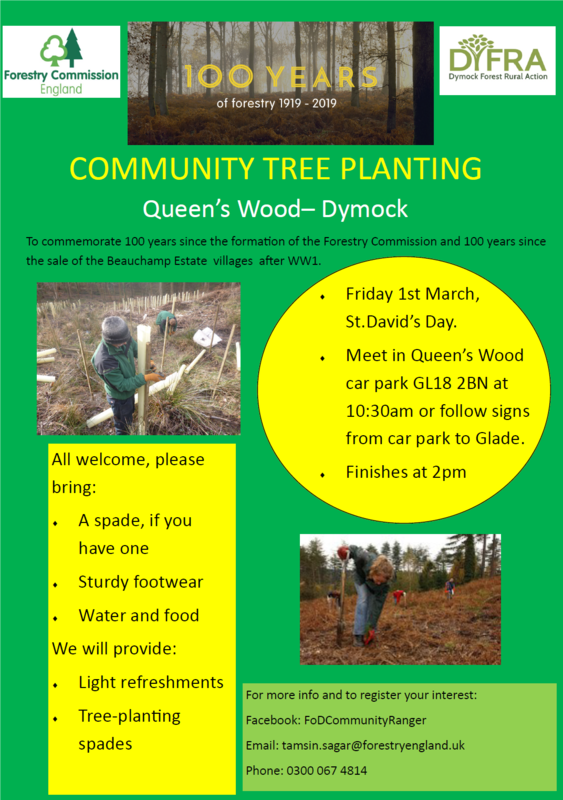 Plans are in place to open this Daffodil season with a Forestry Commission (FC) event at Queens Wood, with local community groups invited to a tree planting event at The Centenary Glade, 500m from Kempley Green, Queens Wood car park (GL18 2BN). Together on March 1st, St David’s Day (Welsh patron saint, whose emblem is the daffodil) local people are welcome to assist with the planting of several hundred native species trees. In short time these will soon create a thick understorey around the Glade edge, valuable for cover, nesting and food for woodland edge species. This exemplar site for ancient woodland rejuvenation will commemorate the 100th anniversary of the founding of the Forestry Commission. The Centenary Glade project will also mark the signing of the Versailles Peace Treaty, six months after the 1918 Armistice. Many local groups over the last four years have looked at the events around the Great War, the Dymock poets’ reflections, and how access to the countryside has been maintained for walkers, riders and the enjoyment of nature. Building on the themes of previous years there will be new exhibitions celebrating the sale to local people of Beauchamp properties in Kempley, Fishpool, Much Marcle, Four Oaks, Dymock, & Redmarley, in July 1919. Leaders of special interest groups are asked to get in touch, and register their interest to take part on St David’s Day; this may be to bring a school class, walking group, or countryside/ heritage organisation. Particularly welcome are landscaping contractors, conservation professionals, forestry workers and natural historians interested in the long term goals for the site. The Glade will serve as a community resource within the Golden Triangle and as a learning centre to inform public interest about the countryside and woodland management in a climate-changed world. The longer-term project looks forward to the next hundred years of research into the sustainable management of an increasingly rare English habitat.